Print is obviously my first love. “Print is a feeling made touchable.” The sensation, the smell, … I can go on and on. So many things no other medium can achieve. So many ways to surprise your audience with print. And yet so sad that these days we consider print as a dying animal. They say print is no good for the environment. They say it is a less efficient way of communicating. Big malefactor? 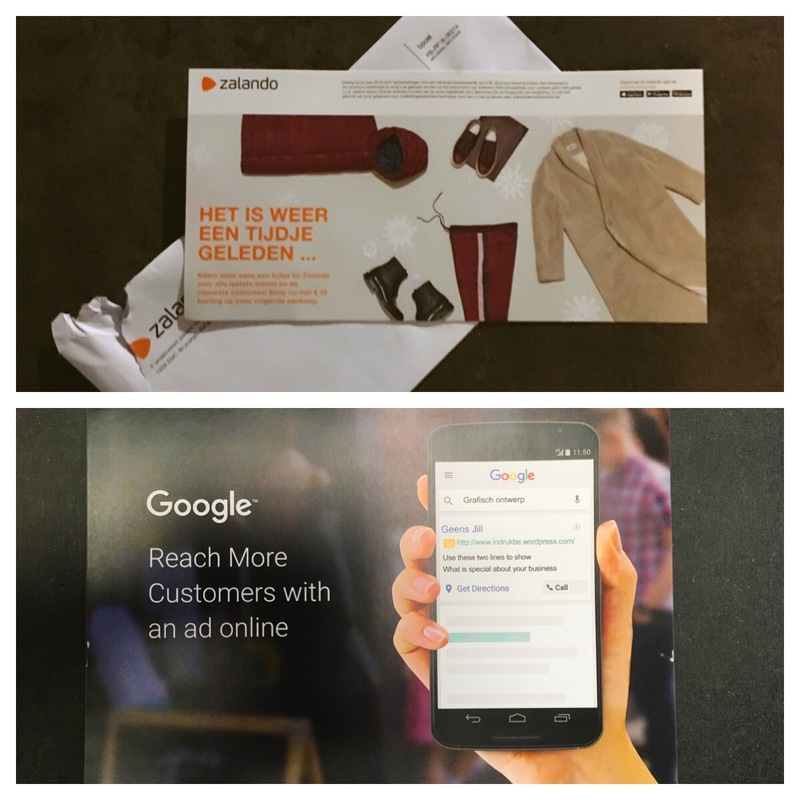 Online communication in all of it’s forms: websites replacing business cards and brochures, e-mailings replacing snail mail. Is this true or just something we presume… Let’s take a closer look. “Paper is no good for the environment.” Not quite right! Thanks to organizations as FSC, awareness grows and when in FSC forests trees are chopped, new ones are planted. So actually forests are kept alive and are growing thanks to FSC! Furthermore most of the European paper doesn’t even come from chopped trees anymore but from recycling which is the most environmental friendly option. In numbers: 1000 kg CO2 per ton of paper is produced when making paper out of wood while this is only 180 kg per ton when it’s produced by recycling. You can recycle paper up to 5 times so do the math! “Online communication is better for the environment because there is no waste?” I don’t think so… The electronics computers are made off, contain all sorts of hazardous materials – techno trash – that are extremely unsafe for our environment. 20-50 millions tonnes are generated a year worldwide. Most of it ends up in China, Nigeria, Ghana, Pakistan and India. These hard metals and dangerous chemicals contribute to global warming and people living in the neighborhood of these garbage belts suffer from severe diseases such as cancers. “For reading digital media are just as or more efficient.” Nope. Sorry. Not true either. It is a proven fact that when read on paper content is better remembered and learned. Research shows that when you read from paper you create kind of a mental map which results in better processing the information you absorbed. When reading from a digital source you tend to scan the information and process and remember less of it. Is there no good at all to digital communication? Of course there is! But it is not king. Just remember that. 🙂 I will throw in a few pro’s. Digital communication is super fast. When you finish the design, press the publish button et voilà. The message is out. Online communication is easily adaptable. If you missed a spelling error, you just get it out. That’s all. In print your mistake will last a lifetime. Digital communication can be personalized to any extent. But wait a minute, come to think of it, so can printed communication! Who read my last post already knows… the sum is more than the whole of it’s parts. And that’s not different in the world of communication. For example: tease your audience by sending a nice card in a handsome envelop to draw the attention. Follow up with an e-mailing referring to the card and offer your audience something useful which they can obtain through your website. This campaign is measurable and efficient. Why not just send the e-mail? Because you will miss the surprise effect and the attention. People will probably not even open your e-mail because they get a hundred a day and they don’t know you … yet. Postcards are far more rare. (People receive a mere sixteen a week while they receive a hundred mails!) So you stand out. Also a big chance that more people will read your card because it is left on the kitchen table. You’ll get more exposure. Everyone passing catches a glimpse while the e-mail is ignored only by the recipient. Why choose between offline and online communication? Don’t! Make it inline! Use best of both worlds and make them reinforce each other so your message gets more powerful. Bottom line? Offline + online = inline! Mijn artikel werd op 5 december gepubliceerd op de blog van puredigitalshow.com.